If you’re anything like me, you’ve read all 13 books in Lemony Snicket’s (penname for Daniel Handler) iconic series – A Series of Unfortunate Events. You were then ecstatic to see it become a movie, loving every second of it, but being extremely disappointed when no sequels were made. Well, it’s our time, kids. And the first look is really something to behold. In 2014, Netflix announced that they would be creating a television show out of the beloved, yet somewhat creepy, children’s series. Back in March, it was confirmed that none other than Neil Patrick Harris would play the scheming (yet extremely entertaining, or is that just me?) Count Olaf – the evil caretaker of the orphaned Baudelaire children. You may remember Count Olaf in the movie being played by the amazing Jim Carrey, and you can’t really say that he didn’t do it justice. To me it was perfect, so how was Neil Patrick Harris supposed to top that? 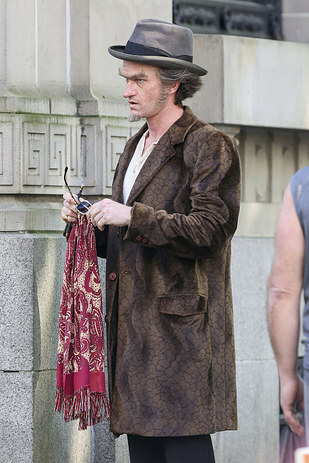 With filming currently underway in Vancouver, Canada, a first look at images from the set has proven that maybe NPH will be able to do it justice. The images are both quite disturbing and amazing at the same time. The 42-year-old has the unibrow, the menacing scowl, the receding hairline, a fake nose, the slicked-back hair and scruffy unclean clothes. It’s all there – and it’s all quite perfect. And that, my friends, is the sound of all my doubts about NPH playing Count Olaf washing away. Like the books, the drama is set to follow the orphaned siblings Violet, Klaus and Sunny Baudelaire after they are sent to live with their distant relative Olaf, whose main goal is to steal the fortune left to the children from their parents. Netflix aims for the TV drama to have an all-ages appeal, making it something the whole family could watch together – as long as the whole family is in the mood for a little dark humour. Created by True Blood writer, Mark Hudis, the upcoming series is said to consist of 13 episodes. Presumably meaning one for each of the books in the series. While no dates have been set, A Series of Unfortunate Events is set to hit Netflix later this year.